Night Shift is an optional feature that warms up the colour palette of a device’s screen, particularly late in the day. It’s believed that cooler (bluer) artificial light from a screen can affect a person’s circadian rhythms and disturb their sleep, and Night Shift is designed to stop this happening. Night Shift was added as part of the Sierra update, so you’ll need to be running that or a later version of macOS. Here’s how to update macOS on a Mac. 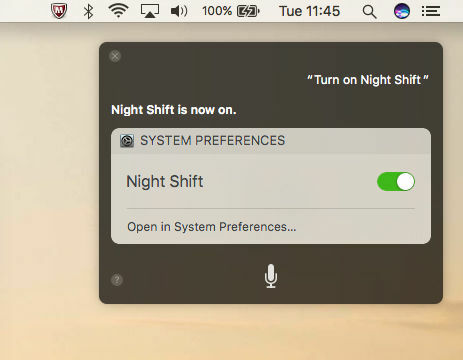 If at any point you decide that your Mac’s screen is making you feel tired or straining your eyes, you fancy a snooze in a bit etc, you can switch on Night Shift mode manually. This is very easy to do. Open the Notification Centre sidebar (if it’s not open already) by clicking the icon with three dots and three lines at the very top right of your Mac’s screen, or by swiping from right to left on your trackpad. 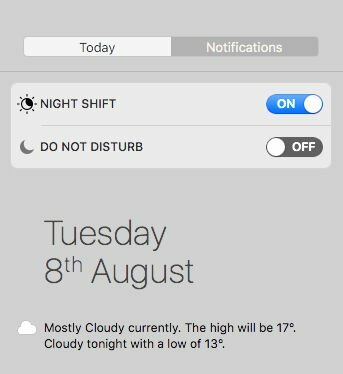 Scroll up a little and two toggle switches – Night Shift and Do Not Disturb – will appear above the date (if you’re in the Today screen) or the latest notification (if you’re in the Notifications screen). Click the Night Shift toggle; it will turn blue, while the whole screen will change to a warmer colour palette. Open System Preferences > Displays, and click the Night Shift tab on the far right. Where it says Manual, tick the box that says ‘Turn On Until Tomorrow‘. Generally speaking we’d say it’s a far better idea to set Night Shift to automatically follow a schedule – otherwise you’re dependent on thinking about your sleep hygiene at some point late in the day. 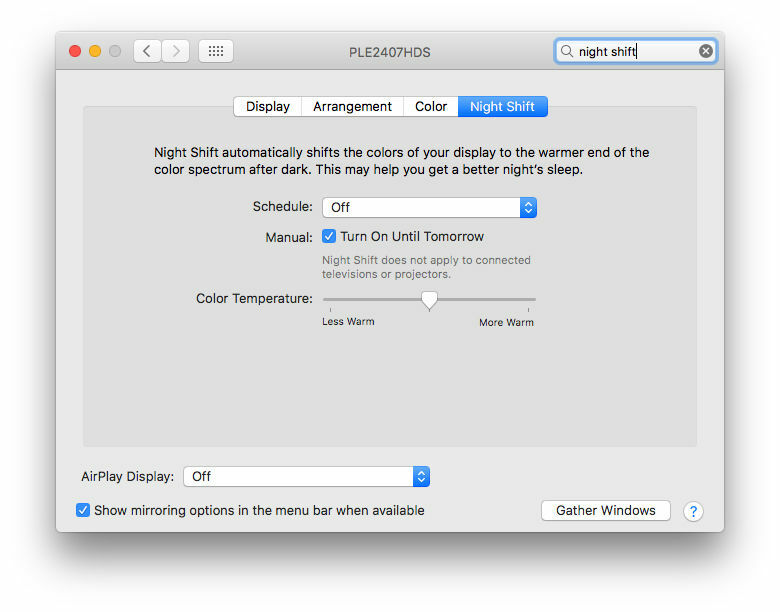 As before go to System Preferences > Displays and click the Night Shift tab. In the dropdown menu you can choose the Sunset to Sunrise option or create your own custom schedule. Fill in the From and To fields and Night Shift will come on automatically between those times. 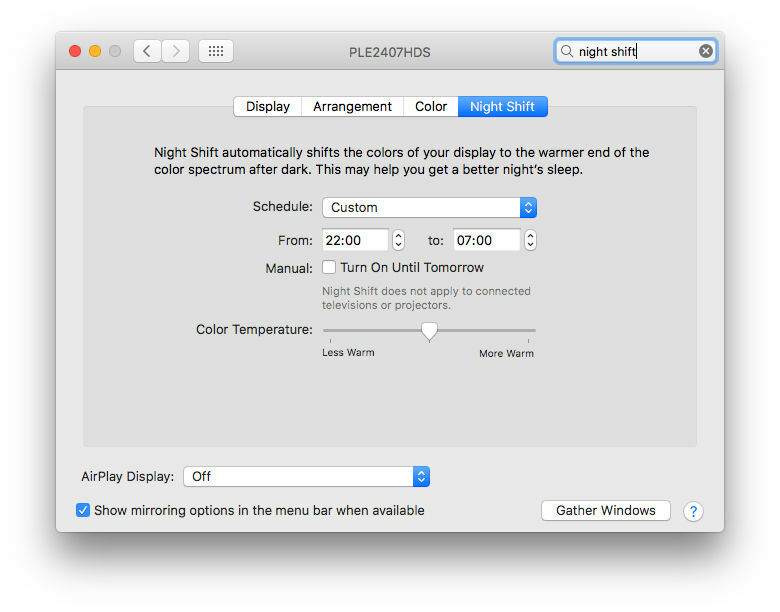 In the same section of System Preferences (Displays > Night Shift) you can adjust how radically Night Shift will alter the colour balance of your screen. Use the slider labelled ‘Color Temperature’ to suit your preferences. As long as you’re holding down the mouse button to move the slider, the screen will change colour to give you a preview; once you let go, it will slowly fade back into the standard setting for right now, whether that’s Night Shift or your conventional colour balance.